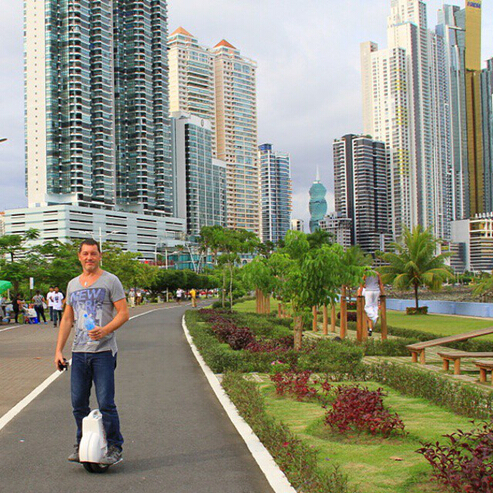 Airwheel Q3 electric unicycle is the only model with top travel range in Airwheel family. Compared with other Q-series models, Q3 model has its own features. Q-series is designed after X-series. Q3 is the first model in Q-series. It is not only compact but also with powerful performance. This is an amazing electric unicycle with both compact exterior look and functional inner structure. Q3 is the first designed model for this new Q-series. There was no such design on market before. It is totally new. The twin wheels design is so different from previous one wheel design. Q3 with smooth shape is preferred by young people. The texture design on the cover tire also provides us reliable and stable feeling. You can see the multi-functional feature of Q3 from above. Some people may regard this “mixed style” as “across the board”, but the real electric unicycle fans will not agree with that. As a new invention, electric unicycle is not defined as a transportation tool yet, it can be used either as a commuting tool or as a new fashionable toy. As a new invention, electric unicycle combined the advantages from both four wheeled car and two wheeled bicycle, and upgraded based on that. It is agile and fashionable. The vast majority of cross-border transporter only cross the boarder in sense level, but failed in function aspect due to lack of profession. You can see this professional spirit from Airwheel Q3. This two-wheeled scooter is multi-functional. It has the same nice design as cars, and added intelligent technology. The energy saving, eco-friendly and portable features of Airwheel Q3 make it a real personal transporter. The core design purpose of Airwheel Q3 is to reduce its weight and improve its function. It solved the problem that intelligent electric transporter can only travel for short distance, which makes Q3 new and special. Q3 electric self-balancing scooter is powerful and functional, and can be used for sports. Equipped with the most advanced intelligent chips, world’s top brand battery “SONY“， maglev motor, light and solid plastic casing and pedal, it is loved by more and more people.